I suffer from paruresis, one of the most common anxiety disorders, yet the least talked about. Paruresis, according to Wikipedia, is a type of phobia in which the sufferer is unable to urinate in the real or imaginary presence of others, such as in a public washroom. I have had this condition for as far back as I can remember. In fact, I don't have a single memory of having used the washroom at school. Not one. I would either hold it until the end of the day or duck home at recess - we lived just a few blocks away. By talking about it with those closest to me, it has a less debilitating effect than it once did. In fact, I often completely forget that I have this issue as my brain and my bladder get in synch with my normal day-to-day routine. Then we go on a trip. This weekend, we spent many hours in the car driving from Fort McMurray to Calgary and from Calgary to Premier Lake in the Kootenays. The days were hot and we drank lots of water to stay hydrated. When you drink lots of water, eventually you have to pee. You know when you're driving along and you see a car pulled over and there is a guy standing next to his vehicle trying to look nonchalant while emptying his bladder? I can't imagine being able to do that. I would never even try. My brain, and my bladder, shut down even imagining it. When the pain was particularly bad, I pulled over and dashed off into the bush, hoping for some privacy and relief. I got the former, but not the latter. As much as I tried to relax into it, nothing started to flow. We ended up finding a restaurant in Radium Hot Springs that was pretty much empty. That provided for me a perfect scenario: a private washroom and no line-ups. When I know someone is waiting on the other side of the door, I might as well be dangling my privates on the side of the highway; everything shuts down, immediately. The same thing happened on the return trip, the difference being that there were plenty of outhouses and pull outs that were completely empty of vehicles. I went into one of those and tried to go. However, shuffling feet outside made me think that someone was waiting to use the facility. Once again, I shut down. Turns out that the shuffling feet turned out to belong to my own family, not strangers who had pulled in. If you're normal, you're probably shaking your head saying "Get over it Buddy. It's just going to the bathroom. Everybody does it." If you're like me, you're probably nodding your head as you understand and feel every word I've written. I have been in a handful of situations in my life when the paruresis caused me intense pain and discomfort. In my teens, I went on a 7-day horse riding adventure with a large group of kids through central Manitoba. We rode by day and camped in tents by night - there was not a private washroom or outhouse in sight. So, imagine the impact on a body riding a horse for that long. Now imagine the added impact with having a full bladder (and in that case, bowel). I was not well. The bathroom in the farmhouse that we stayed at on one of the nights saved my life. Heather and I travelled to Italy in 2006. The flight across the big pond is long, and despite the fact I kept my fluid intake to a minimum, eventually I had to pee. I waited until the entire plane was asleep before trying the dreaded airplane lavatory. Despite total silence and nobody standing outside the door, my anxiety took over and I was unable to relieve myself. I had to wait until we were safely in the terminal in Rome before I had the optimal environment for successful urination. I've become much more comfortable with using cubicles in airports, though there was a time that even those were a pointless exercise. 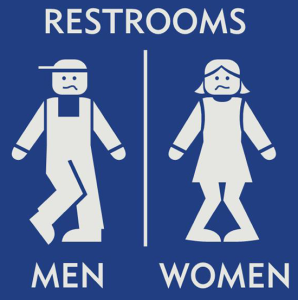 I'm also good with certain types of bathrooms in restaurants, schools and public institutions. My Achilles heel is urinals, or the thought of standing side by side with a long row of guys and comfortably relieving myself. I can imagine what it might be like, but it has never happened, ever. 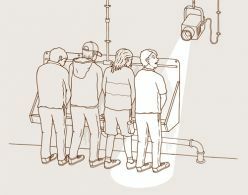 There is an episode of Seinfeld that smacks in my memory of a self-help group of guys suffering from Shy Bladder Syndrome who go on a field trip to a baseball stadium with the express purpose of using the trough in the men's washroom. I shudder when I think of it. All of this begs the question of why? What happened that caused this debilitating condition? I think I know. I have this sharp memory of having peed my pants in Mrs. Barabash's Grade One class at Assiniboine School. The classroom had its own private bathroom. I imagine that these types of incidents were common at that age and having a bathroom right there was probably important. The teacher found me a pair of adult pants for me to wear, the principal's I believe, and I had to complete the day looking like an utter fool - at least that's what I imagine. I remember the incident, but not the feelings. It may require some hypnosis to unlock that trauma. I've lived with paruresis my whole life and manage to make it work. I've become better over the years, but still end up in situations like this weekend when it becomes overwhelming. I was so uncomfortable and intensely frustrated with myself. This time, I was inspired to try to do something about it. In 48 years, I had not bothered to find out if this thing had a name; I just chose to not talk about it and adjust things accordingly. It's a bit embarrassing to reveal something so personal, but I've had great success in making major changes in my life by writing about it and sharing it with others. I know I'm not alone. In fact, there could be people that I've known all my life who suffer from the same thing but have never been comfortable enough, or had the opportunity to talk about it. Maybe this can start a conversation and some healing. If you're ever standing next to me at the urinals, you'll know I've made some progress.